Ahead of the second season of web-series Maid to Order, we chat with its star and writer. 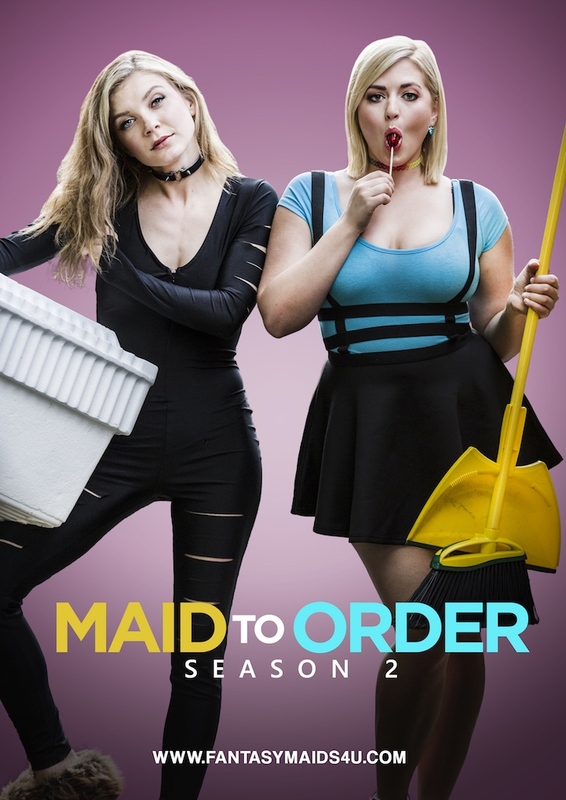 Maid to Order, which is based on House of Cards actress Katie Carpenter’s life as a burgeoning actress, tells of two clueless roommates that start a fantasy maids service, battling urban Atlanta and their own denial of reality. Carpenter and Kendra Carelli star. Season Two continues the story of two clueless roommates who start a fantasy maid service only to discover fantasy is just as hard to manage as reality. This time around, Margot (Carpenter) must maneuver urban Atlanta on her own as June (Carelli) faces her own obstacles in Los Angeles. Featuring scene- stealing performances from Clare Carey (Weeds, Jericho), Michelle Rose (Too Close To Home), and a diverse array of Atlanta's up-and-coming talent, Maid to Order Season Two picks up what last season laid down. Perfect for fans of Two Broke Girls, Community, and Orange is the New Black, catch the season premiere on Youtube July 27th, or at fantasymaids4u.com. Is there one aspect of Maid to Order you love playing most? I love the world we created - it’s a mix of reality and fantasy; a place where characters are free to be themselves, with nothing to lose. It really allows us to create our own form of hilarity without a lot of limitations. The show is inspired by your own journey - but just how close to the character are you? Margot is a piece of me that you might find after several shots of tequila - but even then, I have a bit more conscientiousness than she does. I tend to think about consequences, so it’s actually very fun to play someone who lives completely in the now. I am blunt like her though - you’re going to get a straight answer if you ask my opinion, good or bad! Where do you think the show differs from other webseries? I think we developed our niche as a show, one that is fresh, fun, topically relevant, and grounded in the city we live in. Truly we modelled it off of shows we enjoy, and even with our miniscule budget, we believe we have a high level of production that I think speaks for itself. Everything we put out reflects back on our branding as a flirty, funny, and ridiculous series. Aside from providing lots of laughs, do you think there’s a message to the series? One point we really tried to make the first season is that everyone should be able to follow their dreams. I think my generation in general is really designing our own lives. There’s this wonderful diversity that’s developed because a lot of us no longer want to stick to the basic 9-5 career, the typical family structure, white picket fence kind of American Dream. We’re really creating our own, and that’s something we really wanted to play with in our series. A few messages to expect this season are friendship in the face of danger, choosing to be selfless instead of selfish, and throwing your ego to the side for the greater good. How was it to work with director Kevin Welch? What does he bring to the series? Kevin is amazing! He’s actually come up Assistant Directing and Producing, so he has a very solid understanding of shot coverage, of what moments are needed on camera, and he’s got a great energy so he’s able to bring out the best in his actors. We also had several guest directors; Tutul Rahman, who works for Coca-cola by day and works with Atlanta comedy group Outta Towne nights/weekend, and when no one’s “Outta Towne,” Ryan Monolopolus, who has a background in stunts and directing high quality Atlanta-based projects, and Rhavynn Drummer, who’s the casting director for Tyler Perry Studios and one of the sweetest people you’ll ever meet. Are there any significant moments in your life that play out note-for-note on the series? I also have searched for gigs on Craigslist, and showed up to a stranger’s house two hours away. I was asked to talk in a southern drawl for this guys’ TV show (or so he says), in which I described swingers and their lives. I put on a sundress, read his two pages of dialogue in front of a camcorder, and he paid me $300. Cash. Do you think it has the makings of more than one genre? I think we’re pretty set on comedy, but this season we do have a bit of action as well, including a head hit that left me with just the right amount of whiplash to remember it by. What would be your ideal home for Maid to Order if you could choose for any network to pick it up? Man…. This is like asking me to go into a Frozen Yogurt shop and asking me to pick one topping - you’re crazy!! An obvious and amazing choice would be Comedy Central. I think they would readily accept our antics and maybe even pump us up a notch. Also, HBO really seems to allow their shows to have their own unique voice, I’m talking about shows like Silicon Valley and Insecure, and I love that. FX had It’s Always Sunny in Philadelphia and let them go pretty wild (PS our last episode is named after it) and Atlanta, which is literally shot down the street from my old house in Bankhead; I really respected how much they showed off the city as that’s something we try to do with our show. Oh, and Netflix. Have you seen GLOW? So much yas!